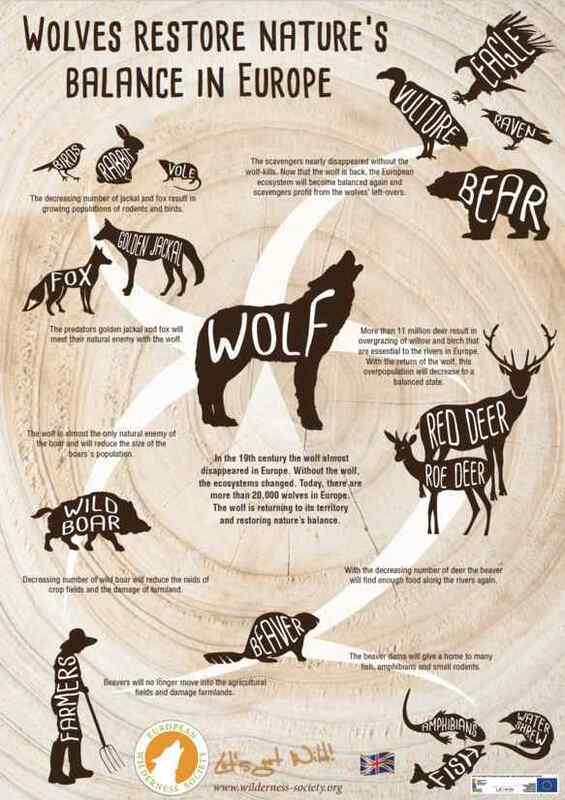 Wolf poster: available in 4 more languages! Last week, European Wilderness Society published the poster on how ‘Wolves restore nature’s balance in Europe’ in the German, English, Italian, Spanish, Slovakian and Ukrainian languages. We are now expanding with translations in Czech, French, Dutch and Portuguese. Download the poster ‘Wolves restore nature’s balance in Europe’ for free! Spread the word on the essential role of the wolf in the European Wilderness! The poster is part of the bilingual wilderness school-project ‘Let’s get Wild!‘. It visualises the role and influence that this large carnivore can have in the European ecosystems. For example, the presence of the wolf affects many different animals, such as the predators (fox, golden jackal), herbivores (e.g., red deer, roe deer), scavengers (e.g., raven, vulture), and even humans! Wolves restore nature’s balance in Europe – poster downloads as PDF for your personal use as well as for educational purposes. For the previously published versions, click here. You can copy, print and redistribute the material in any medium or format, but please do not modify it without permission. We will also have printed versions of the posters available in September. Thank you.